The relationship between the American Red Cross and the military goes back more than a century to when our founder Clara Barton first recruited nurses during the Civil War. Today, through the Red Cross Service to the Armed Forces (SAF) program we carry on this tradition by offering critical services to men and women in all branches of the United States military, active duty personnel, reservists and members of the National Guard, and their families. Since April 2015 Akinori Tsuchida has managed the SAF program in Greater NY. Tsuchida, a veteran himself, retired from the Army in 2008 and then began volunteering for the American Red Cross SAF program. A few years later, he became a SAF overseas station manager working at United States military bases in Korea. This past spring he returned to NYC to oversee the program in Greater NY. Earlier this week we talked with Tsuchida about the services we provide to military members and their families in Greater NY and what Veterans Day means to him. 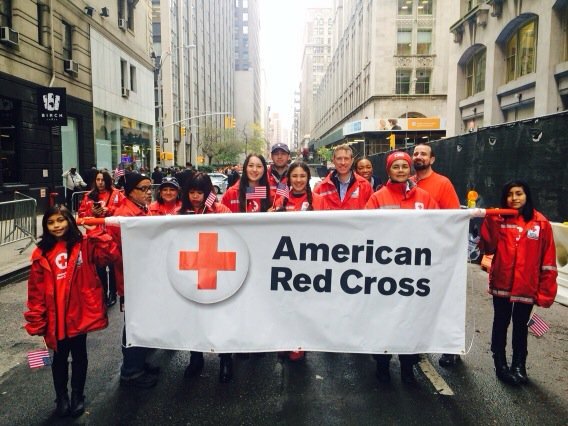 What are some of the services the American Red Cross provides to active duty service members? Our primary mission is serving as a means of communication between the families and the military anywhere in the world. We deliver over 1,600 emergency messages in the New York Region every year. I like to tell people if you do the math it comes out to almost 5 families a day in this region that required some sort of Red Cross emergency communication service. Even though we do have all this technology, there are many instances where the Red Cross is the only way the family can communicate quickly with one another. What services does the American Red Cross provide for veterans? We continue to work with service members even after they get out. We are one of the volunteer services at the VA hospitals. We also provide financial assistance in partnership with various military aid societies. Are there any other programs that you would like to talk about? Something that we’re really proud of is our re-connections workshop. It's a series of modules taught by licensed mental-health workers. They’re free and they focus on reintegration and re-engagement skills for service members, veterans and their families. We have these different topics like communication, stress, identifying depression, working through anger. It’s free, it's confidential and it’s pretty successful. We’ve been doing it all over the country. What do most people not know about the Services to the Armed Forces? Some people don’t realize that the Red Cross deploys with the military. Right now we have two overseas deployed stations: one is in Djibouti, which is in the Horn of Africa and the other one is in Kuwait. We continue to support all the military in the Middle East through those Red Cross stations. We go where they go. For me as a veteran it’s not about me, it's really about all of my friends who I’ve served with. We try to keep in touch, even if it's once a year, and thank each other for our service. I don’t think of it as a sad holiday though, it's a day of reflection and think about the people you served with and the people who aren’t here anymore. I had the pleasure of working with Mr. Tsuchida while in the Army many years ago, and he continues to exemplify what it truly means to serve. Best wishes to you and all Veterans on this special day.